Astonishing visuals are the norm in Loreto, Baja California Sur. Crystal blue waters of the Sea of Cortez. Dry desert land with a stray cactus here and there. The locals going about their business, ready smile. 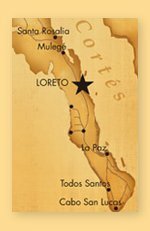 But the farmer’s market (aka people flocking to fruit) really stretches the imagination; set in the middle of a desert, in the middle of nowhere, even by Loreto standards it challenges your concept of time and place. In the distance, the towering Sierra de Giganta mountain range simmer, slightly blurred from the rising heat. I mean, it’s wild. Any moment Quentin Tarantino is liable to appear with a crew on location for another zombie pop-culture film. Speaking of film, I admit this is a vanity project. This video. Through-and-through. I did it purely for fun, and the adrenaline rush I get from seeing a bunch of raw footage come together, especially when I think it suits something like the farmer’s market so well. But that’s just me. Again, I know, vanity! Tradition! (Hint: Fiddler) But what the heck, I wanted to try something different. Maybe it’s a home movie with a fancy lens, and you’ll tell me to pound salt. It’s okay, I probably agree. Being a gadget fiend, we brought some new gear to Loreto and I was finally able to test out a new lens configuration at 1080p. I was going for an indie film look. A tall order, but a nice change up from our regular video work here on SSC. Perhaps I’m inspired by the upcoming Cinequest film festival, or the Adobe Youth Voices film camp I covered last weekend. 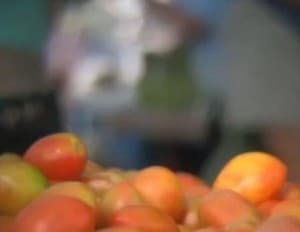 I was trying to capture the feeling, the mood of the market using mostly ambient sound and video. The boy with the megaphone, I love that moment! I actually missed it the first time as he shouted out in Spanish across the marketplace using what looks like a home-made megaphone. I caught his attention, waved, and asked him to do it again. I’m not sure why, but it is just so darn cool. For those interested in technical details, read on. The lens in question is actually a Canon SLR lens, the kind used on a regular still camera. But when you mount it onto a HD video camera like the Canon using a special adapter, you can achieve the much-loved-by-film-makers shallow depth-of-field look. Frankly, I think it’s over-used. And there is still no substitute for telling a great story, or conveying emotion, and mood using the actors, the characters. Not a fancy camera. There’s something to be said for just taking a Flip to the streets—and obviously we use some handy Flip in this video. But, you know, I kind of like the look of this video. This lens is a devil to use though, and the Baja desert is not exactly the cleanest place to shoot. Hence, the specs of dust and dirt you see in this video. The lens with adapter configuration is especially sensitive to the lightest imperfection, which is why I should be more diligent next time blowing it out properly with the cleaner. But what do I know? I’m learning as I go. For now, think of the gritty look as an ultra-cool special effect to age and weather the “film” stock. Maybe it costs others millions? The other difficulty: everything is upside down. When looking at the viewfinder, the world is not as you normally see it. Left is right. Up is down. So moving the camera to center a subject becomes tricky. Which explains why a lot of the time the camera seems to be hunting—a little to the left, a little up, and back to the right again—for the sweet spot. Funny enough, over time, this has been billed as cool. Often I find it disorienting and annoying. That is why I try to mask it with interesting music and quick cuts. Or occasionally use slow motion effects. So when the raw footage comes into Premiere Pro, we need to rotate it all, zoom in a little to remove the dark edges (which explains why most of the shots are pretty tight). All this processing takes time. Time is money. Except in this case, where it’s all passion. 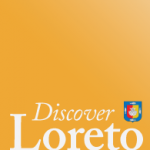 Love for Loreto, the farmer’s market, and all the people that continue to build a wonderful community and respect the locals and those that have come before. Like I said, astonishing.